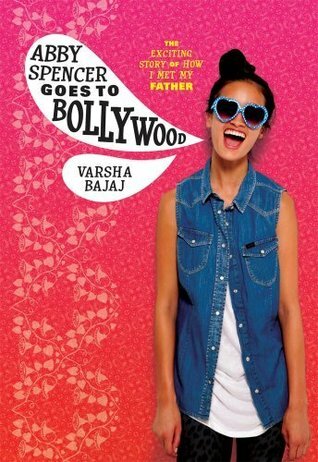 SUMMARY: Thirteen-year old Abby Spencer learns that her father, whom she has never met, is a mega-famous Bollywood star. Abby travels to Mumbai, India to meet him for the first time and learn about her Indian heritage. REVIEW: Abby Spencer is a cute story with a cute protagonist who behaves exactly as I would expect a thirteen-year old girl to behave in her situation. Though the story begins in Houston, TX, the setting changes when Abby travels to Mumbai to meet her father for the first time. For me, Abby Spencer (both the book and the girl) are most interesting once Abby goes to Mumbai. I love how Abby talks about the beauty and crowds of Mumbai and notices the extreme poverty of the area. She compares this with her father's movie star lifestyle and her own life in Houston, and she does not miss the gaping discrepancies among them. I love Abby's parents. They are not perfect, but they both really try to do right by their daughter. I also like that Abby's grandparents (on both sides) play significant roles in Abby's life. There is a little romance between Abby and a boy she meets in Mumbai who happens to live in Dallas, TX. It's an okay romance, appropriately clean for the young ages of the characters. I didn't like that the boy happened to live in Dallas. It's overly convenient, and the characters are too young to attempt a long-distance relationship/ friendship--I wish the boy lived in Mumbai and Abby could see him when she visited as she grew older. To me, that would make for a cuter romance if Bajaj ever wrote a sequel. Speaking of romance...if Bajaj ever writes a New Adult romance/prequel featuring Abby's college-age parents, I would be all over that. I would love to know more about how they met and their relationship! THE BOTTOM LINE: It's cute and clean and will have a middle school audience. Language: very mild; some simulated profanity such as "Oh, Schmidt!"